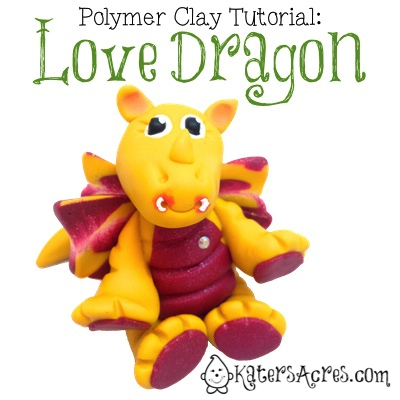 This polymer clay dragon tutorial that follows is to help you make a similar dragon with little heart themed accessories. Please know that the polymer clay dragon frame Christi makes in her book is much more realistic, scary, and serpentine-like. You are free to choose to make either project … or make them BOTH! This week’s project is inspired by Christi’s Dragon and is found in the current book, “Polymer Clay & Mixed Media Together at Last” by Christi Friesen on page 112. Also, for those of you Kindle devotees, this book is also available for your Kindle! Find a frame (see this post on some awesome places to find inexpensive frames). Decide what theme, colors, or ideas you will use to decorate your frame. Pick your polymer clay colors. Bake your dragon & accessories. PDF is FREE to project participants through 2/13/14. THIS OFFER FOR THE FREE PDF HAS NOW EXPIRED. You may still purchase this tutorial in my shop here or get a similar project in Christi’s book. The free dragon tutorial that was written above is only part of today’s Friesen Project. The other part is decorating a frame. You can make my dragon project above, or you can follow the detailed instructions in Christi’s Book for a serpentine themed monster to completely decorate a frame. My finished frame is show here at the right. And yes … I’m hopelessly in love with my husband and my dragon is a “love dragon!” Yellow as it is my hubby’s favorite color and red for … well … love! This dragon decorates the bare frame where my hubby and I write messages back and forth to each other all the time. The Friesen Project is done in conjunction with Christi Friesen. All tutorials are retaught here with her expressed permission. Please make sure to read about the project here, and get answers to the most common FAQS here.